Bluecol â€˜Uâ€™ is a universal anti freeze and engine coolant which is suitable for use in all vehicles (both petrol and diesel) and will mix safely with all colours and types of antifreeze already in the radiator/expansion tank. 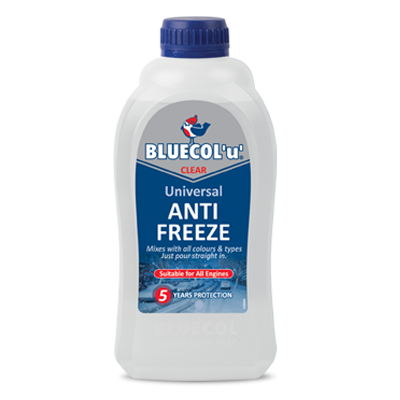 Bluecol â€˜Uâ€™ is the only clear antifreeze available in the UK so it will not distort the colour of the antifreeze already in the cooling system when added. Bluecol â€˜Uâ€™ is ready mixed with de-ionised water at a ratio of 50/50 for added convenience. When Bluecol â€˜Uâ€™ is added to antifreeze already in the cooling system, the synthetic process and additive package in Bluecol â€˜Uâ€™ enhances and revitalizes the qualities of the original antifreeze, providing exceptional all year round protection and performance in all driving conditions. 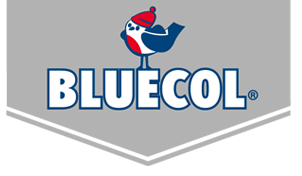 Bluecol â€˜Uâ€™ Antifreeze offers superior corrosion resistance over extended service periods, which can also be left in the system as a coolant and inhibitor against rust up to a maximum 5 years. Bluecol â€˜Uâ€™ conforms to BS6580 (2010) and contains a bittering agent to prevent accidental swallowing and consequential harmful effects to humans and animals. 1. Whilst engine is cold, remove cap from radiator or expansion tank. 3. If necessary, top-up using Bluecol U Antifreeze to fill level as recommended by vehicle manufacturer (refer to handbook).